I was quite fortunate to be asked recently to write a guest post (as an overeducated seamstress) on Seamstress Erin's blog, so I wrote about what I love most (besides the Roommate & Bella): travel & textiles! 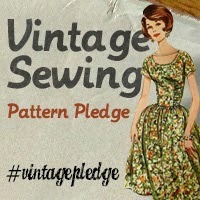 In honor of Erin's recent completion of her PhD, she's asked a bunch of other overeducated sewists to blog. My post is about textiles we collected in Ghana, Japan, Thailand & Ladakh. Congrats to Erin; thanks for the honor...and my apologies for being a bad sewing blogger right now. The weather is amazing here (eternal spring! ), and we have been spending a lot of time working on our yard (after 3 years of doing almost nothing). 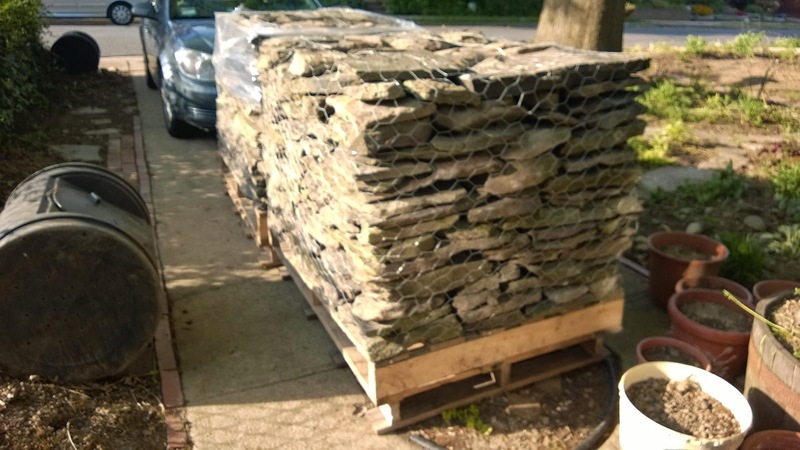 We're building a rock wall now! Finally, if you liked my country music clothing posts (after a trip to Nashville), you might enjoy this article about a new photography exhibit in LA (Country Music Icons). Of especial interest is a photo of Gram Parsons in his leather suit, along with Nudie Cohn, the tailor who designed many of the amazing outfits seen in these photos & in my older posts. Bella & I both like birds. So when we're traveling (me & the Roommate, not me & Bella), I'm on the lookout for any natural history included on artwork. Especially birds! This beautiful huipil from (probably) San Miguel Chicaj, has lots of quetzales. All overlapping in what is quite an intricate geometric pattern. Did she embroider by rows, swapping colors? Or by color? In knitting I know it would be by row, but I'm not sure about embroidery. Here's what I love about handmade art: Take some basic elements such as simple repetition, color change, concentric shapes, parallel lines, etc., none of which are difficult to embroider, or to imagine. But in the right hands, WOWZA! Border detail; love the zig-zag & suns! It's a Quetzal Kind of Day! Unless you're an avid birder, or into punk-rock hairstyles, you may not know what a quetzal is. 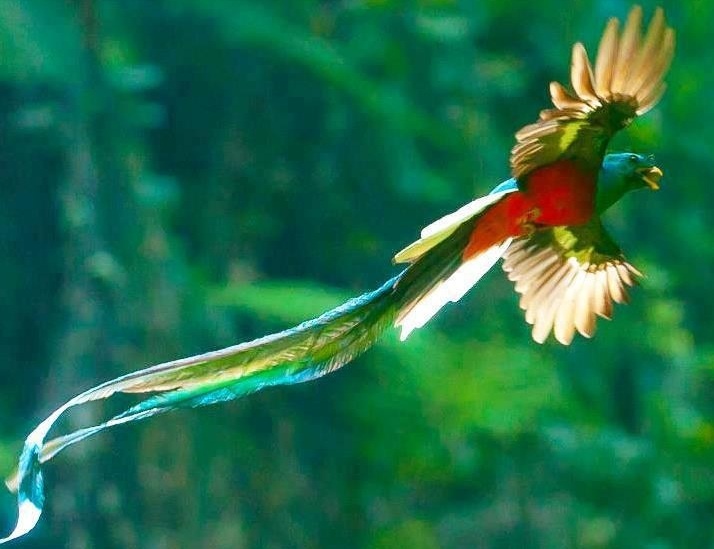 Well, for one thing, quetzales are the national bird of Guatemala. The money is also called Quetzales--I love that! I haven't ever seen one in the wild...not for lack of trying. The Roommate & I have spent lots of times traipsing in rainforests, following a guide, trying to see through dripping leaves & damp binoculars. They are well & truly amazing, and are a common icon for all types of artwork, whether it's for a Mayan ruin, or a huipil, a woman's tunic. I've mentioned before that styles of huipiles are fairly useful to determine the wearer's hometown. Here another from our collection of 7 (never enough! ), both with quetzales as the extremely amazing subtle, repetitive, interlocking embroidered icon. I cannot think of enough adjectives to describe my feeling of wonder when I look at these works of art! From Quetzaltenango (place of the quetzales), here's a masterpiece. BTW, I'm not 100% sure of the origin of this item. If you know better, please leave a comment for me! If you want a glimpse into the complicated world of Guatemalan geography & huipile art, check out Huipils, for their list of towns, each with distinctive embroidery & weaving styles. The mini zipper at the neck is so charming. Each shoulder has a band of velvet. 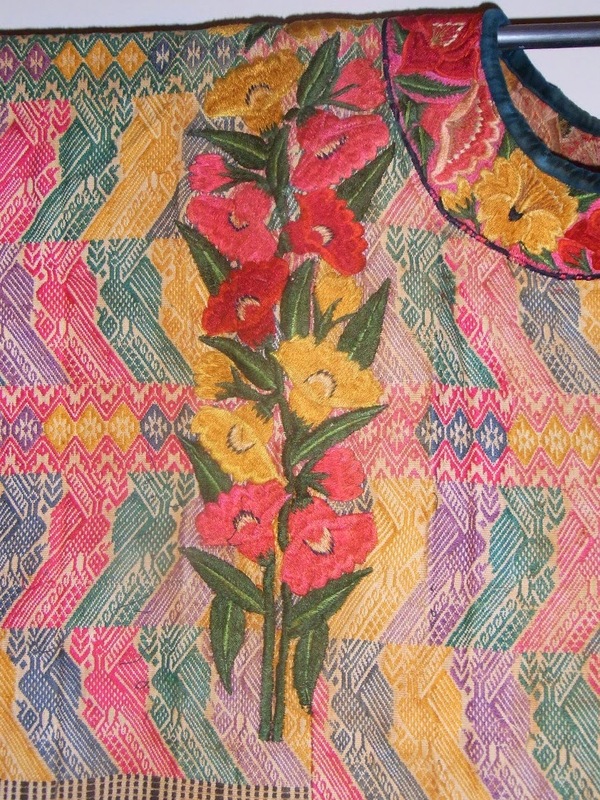 What's fascinating to me about this particular huipil is that it looks to be made of a basic cotton rice or potato sack, then heavily embroidered with the kerned quetzales in multiple colors. THEN, a completely different design & type of embroidery was applied with finer thread. At first I was sure that this was machine embroidery, but after some thought, I don't think it's very likely on a huipil that is a at least 25-30 years old. From reading about these vertical bands, they were apparently first used to disguise seams when narrow bands of fabric had to be pieced together. Because they were so beautiful, when wider base fabric became available the decoration was retained, though it was no longer needed. Stay tuned. I'll have another huipil up next week. Comments/Questions? Let me know. Happy Travails, Inc. Simple theme. Theme images by GelatoPlus. Powered by Blogger.